Today was the day! We were to climb 4300m above sea level, high into the Andes, to visit a very special mountain “WAKAY WILKA” – meaning sacred tears in Quechua. With the sun shining brightly, the blue sky, the buzz of Ollantaytambo; the tourist town surrounding us, we were excited. How cold would it be up there? How long were we going to be? What about water and food? Having prepared ourselves the day before with each of us receiving a beautiful flower bath and healing from Wilma our Curandero (Medicine Woman) we felt very ready to participate in the “Despacho Ceremony”. Blissfully unaware of the experience ahead, we knew that it was going to feed our souls and help us with ‘releasing’ and having the opportunity to sew the seeds for change. Climbing up from the valley floor, winding around many bends and feeling the effects of altitude, our breathing became shallow, the temperature started to drop and a contemplative mood descended across the group. With the landscape hard to determine and totally surrounded in mist, we finally approached the crest of the climb. 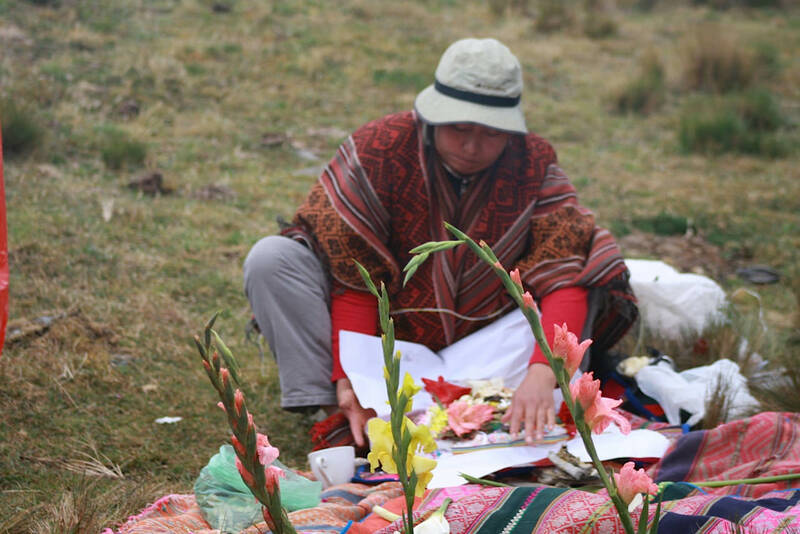 Piling out of the van, pulling on our rain gear and warm clothes, we followed Wilma to a breathtaking ridge where there was just enough flat land to sit in a circle and commence our “Despacho Ceremony”. Before long we were all deep in concentration making our Kintus – combining three coca leaves with the petal of a flower – to offer to the “Despacho Parcel”. Wilma too was communing in her native tongue with mother earth, the elements and spirit. Light rain started to fall but it didn’t seem to affect us or the fire being built as we sat in the stillness communing in our own way. The time had come to blow our intentions, gratitude and prayers into each and every one of the Kintus, then pass them to Wilma who offered the final blessings and placed them into the “Despacho” parcel. Not surprisingly, a common theme in the group was the intention of healing based around children or grandchildren and the wish for new beginnings. As Wilma closed the ceremony, tying the strings of the Despacho Parcel together, she continued to commune with spirit and walked it across to the fire. Placing it there she asked “Wakay Wilka” for our prayers to be heard as they drifted up to her through the smoke. Then something quite amazing happened. The mist suddenly lifted and for the first time that day, we could see Wakay Wilka in all of her glory! Feeling very grateful and basking in the incredible energy, another surprise suddenly revealed itself. Out of nowhere a wild dog appeared very heavily pregnant. We were blown away and humbled by the symbolic representation – “new birth, new beginnings and children”. Our intentions and prayers had definitely been heard. The Power of Ceremony at a sacred site… etched in our memories forever. Listen to Bernadette Logue from Pinch Me Living interview Sharon who shares ancient wisdom garnered from the groups she works with on her tours and also her Feng Shui and Space Clearing tips from around the world. Please note the interview sound is a little distorted but it gets better further into the interview. Create timeless memories of self-discovery, historic beauty, and new-found companionship in one of our tailor-made guided tours of Spain, Sedona and Peru.